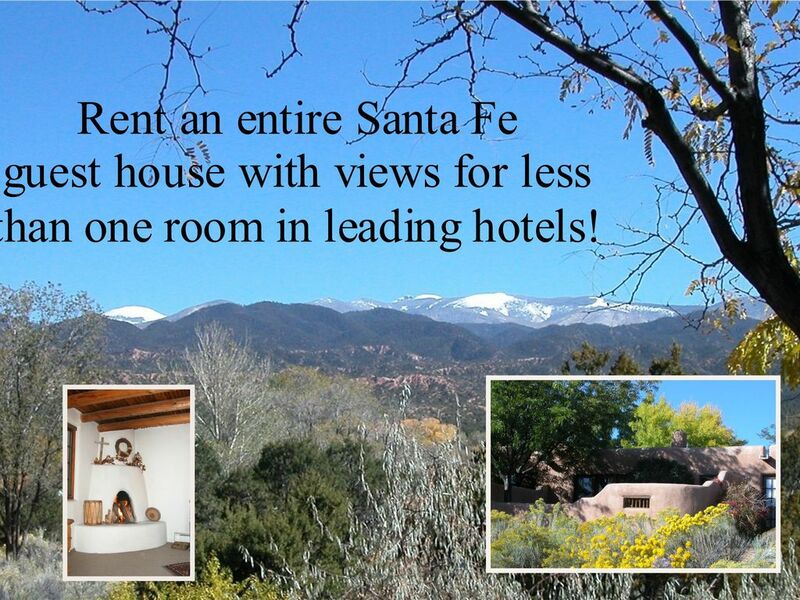 The Guest House on the Hill is on two and a half acres with the owners' home in rural Tesuque, just five minutes from historic downtown Santa Fe, New Mexico. It has a living room with three French doors and an adobe-walled patio, both looking out over the Tesuque Valley to Santa Fe Baldy, Tesuque Peak, and the Santa Fe Ski Basin. There is a large master bedroom with a fireplace and king-size bed, a second bedroom with a queen-sized bed, a sofa bed in the living room, and a fully equipped kitchen. The master bath has a tub/shower, and the second bath has a shower. We are located on 2 1/2 rural acres five miles from the historic downtown Plaza. PLEASE NOTE THAT THE BASE RATE FOR TWO IS $150 PER NIGHT. FOR 3 0R 4, THE RATE IS $195. EXTRA FOR MORE. ALSO THAT THE RATE AND MINIMUM STAY VARIES FOR HOLIDAYS. PLEASE INQUIRE. The owners, George and Donna Amos, enjoy passing on tips for exploring remote Anasazi ruins, mountain and desert hikes, cross-country skiing, museums, art galleries, Indian pueblos and dances, and restaurants. The guest house has a library of books on the Southwest, novels, mysteries, and games. George & Donna Amos, former teachers, now Realtors, have lived in Santa Fe for 40 years and enjoy welcoming people to their guest house from all over the world. We gladly provide suggestions for enjoying the mountains, mesas, opera, concerts, shopping, distinctive restaurants, museums, historic places, Anasazi ruins, pueblo ceremonies, skiing, hikes, and trips to little-known places in Northern New Mexico. George was Chairman of the English Department at Louisiana College from 1970 to 1978. He also taught at Louisiana Tech and Arkansas Central University. He was Realtor of the Year in Santa Fe in 1998. Donna was Teacher of the Year in 1976 in central Louisiana and taught there, at Santa Clara Pueblo and in Santa Fe. Views, country setting in Tesuque yet convenient to town, cozy adobe-style casita with character. Country quiet yet convenience to town, authentic Santa Fe adobe-style home with vigas (log beams), kiva fireplaces, patio with views. Tub shower in master. Shower in 2nd bath. Dozens of art galleries. World class museums. Historic adobe buildings. Ask for name of network. No code required. The location of the property was great the views were beautiful and the neighborhood was very quiet and nice. The guest house itself was small but still very warm. We loved the fireplace in the living room. And the owner provided us with enough firewood and kindling to have a fire every night we were there. The clutter in the closet, the bathrooms and the showers made it very uncomfortable. It was hard to unpack anything and put any of our personal hygiene in the bathroom. The kitchen was cluttered but we did squeeze our stuff in there. But the frozen food in the freezer was a little disconcerting. I would think that VRBO would have some kind of rule about leaving leftover food around. The fact that you could not Open the bathroom or closet doors all the way should be an indicator that there was too much stuff about. We would stay here again if we could not find another place. George and Donna's guest house sweetly welcomed us with a carrot cake and bottle of wine on the dining table, and classical music playing on our arrival. The casita provided what we (two adults and a toddler) wanted which were beautiful mountain and nightime stargazing views, quiet, easy access into town, and all the on-site amenities of W/D, stocked kitchen and applicances. Of note, the directions to the guest house could use some updating as it was a bit like following directions for a scavenger hunt. The Internet is unsecured and was spotty at times. As other reviewers commented on, it is a bit cluttered and dusty. But we liked the uniqueness and homeliness of it, rather than going through a shoe-box management company. We enjoyed our stay! The home is very cozy, clean and comfortable. Some of the windows wouldn't shut and the WiFi didn't work the entire time we were there but other than that we enjoyed our stay. Great view. We had a little bit of difficulty booking due to the 24 hour window that VRBO gives you to complete your reservation. The location was great. Very peaceful. There was a bottle of wine and fresh cookies on the table when we arrived which was very sweet. The kitchen was well stocked with cooking supplies. The house itself was pretty funky though with the smell of mildew when you walked in. There was a hole cut out in the ceiling exposing the insulation. We wanted to cover it so we called the owner who promptly covered it but clearly was not happy about being called. The furnishings were somewhat charming but overall felt old and "tired". Fortunately we were busy and didn't hang out there much. The location was good but we wouldn't stay there again. Million-dollar views! Private, clean, spacious and comfortable. 2 patios! 2 WBFPs! If you’re looking for 5+ luxury accommodations, read no further. But if you seek peaceful, secure, roomy, slightly funky place of your own w/spectatular views, this is it. Wide road hill access. Washer, dryer, dishwasher. Well-appointed kitchen, and ample linens. Remote, quiet, yet approx. 10 minutes from hustle and congestion of Santa Fe. Suggestion: bring flashlight or smartphone. Tesuque hils are dark at night. Nearby Tesuque Village Market for breakfast/lunch/dinner (patio or inside) (wood-fired pizzas.) Whole Foods and Trader Joe’s about 17 minutes away. Don’t miss O’Keeffe Museum, Loretta staircase, Folk Art Museum, Santa Fe Flea across from Buffalo Thunder, Cafe Pasquale’s, The Shed, Paper Dosa, Tomasita’s, Farmers Market (Sat. AM), Bandelier Nat. Monument, Taos Pueblo, 10,000 Waves Japanese Spa, etc. etc. So much to do. A place to make great memories. Rates listed are for two people. Additional guests are $35 per night. Cancellations 60 or more days ahead will be totally refunded. After that, cancellations that are replaced with new bookings, will be refunded in the amount of the rebooking.